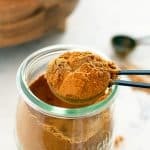 Skip the store-bought, expensive Apple Pie Spice mix and make your own with spices in your pantry. Customize the levels of cinnamon and spices to your liking! Mix all the spices together and store in an airtight container in a cool dark place.